The France-Hayhurst family, Bostock Hall and subsequently Bostock House, Cheshire, and by descent. The serene, pastoral tone invoked by the present picture is a characteristic feature of Teniers' painting of the 1660s. His heightened interest in rural life and nature at this time was no doubt connected to his purchase, in 1662, of Drij Toren, a country house at Perk, in which he installed a studio. Teniers had enjoyed enormous success in the preceding decade. His output in the 1650s, whether produced in his capacity as court painter to Archduke Leopold or for the Antwerp market, displays a high level of sophistication even in the more humble subjects. This contrasts with the simplicity of his landscapes painted at Perk, which tend to extol the virtues of a tranquil rustic existence. Margret Klinge comments: 'These were the years in which his genre painting was dominated by an arcadian view of the countryside. 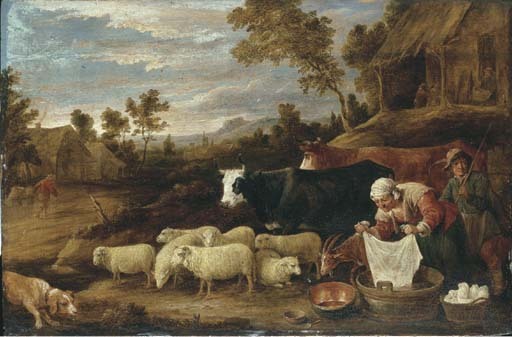 The rural life he presents is happy and carefree - an arcadian idyll' (M. Klinge, in the catalogue of the exhibition, David Teniers the Younger, Antwerp, Koninklijk Museum, 11 May-1 September 1991, p. 22). This arcadian spirit, which was widely appreciated at the time, was expressed by Teniers in perhaps even more romanticised form in a picture of 1668, with the inclusion of classical ruins on top of a hill in the background (ibid., p. 23, fig. 15). The two nonetheless share many similar motifs including, aside from the evident presence of cattle and sheep and the overall tonality and style, the figure (in the present work a woman, in the other a youth) bent over a tub with before it a copper basin and a pottery bowl, suggesting a similar dating for the present picture of circa 1668. For the provenance of the present picture, please see the note to lot 102. THE PROPERTY OF THE EXECUTORS OF THE LATE DINAH FRANCE-HAYHURST REMOVED FROM BOSTOCK HOUSE, CHESHIRE (Lots 10 and 102). THE CONTENTS OF BOSTOCK HOUSE WILL BE SOLD AT CHRISTIE'S SOUTH KENSINGTON ON 21 APRIL AT 10.30 A.M.